Dusting off the cold weather gear! So we are off jet setting again, this time a short trip to our friendly neighbour, New Zealand to check out the ski slopes and hopefully some wineries in Queenstown and a short stop in Dunedin to catch up with a friend that we made while in Zambia last year. So we have had to dust of our cold weather gear pack our gloves, scarfs and beanies before heading to the land of the long White Cloud. We learned so much this past week while volunteering at the school. We helped them with maths, science, social studies, English and of course more sport. We helped the kids write letters to students in Australian schools. We were also able to put the money that everyone donated back at home to good use by going shopping with the principal of the school. We were able to buy much needed items such as teachers guides, work books, dusters for the black board, poster paper, reams of A4 paper, story books, cleaning supplies for the toilets, dictionaries, bags for all the balls that we took over and other bits and pieces. We were still unable to spend all the money so we gave the principal the rest to spend on more books and to go towards supplies for the new vegetable garden. The money will even go towards one boy who doesn't have any shoes as his family are unable to afford to buy him any, that is if an old pair of Corrine's runners that she has given to the principal don't fit him. We are in two minds about the shoes that we have left. We hope that they fit him because they are still in good condition and at the same time we are hoping that they don't fit him because boys of that age should not have to wear second hand ladies shoes and will get a new pair from the money. Either way it will be an improvement on his current shoes that have been hand stitched back together. We were able to see how some of the items we purchased make a direct impact on the school. The cleaning products for the toilets were put to immediate use as the toilets were in such a bad shape. After a but of hard work, and a few buckets of water along with the new disinfectant the toilets were now available for use by the students, the first time in months. For our last day we gave the kids a special treat. We took in oranges, watermelon and fairy bread for them to enjoy but not before one of the kids (the one with out shoes) lead the rest of the class in a prayer to say thanks for us visiting the school and providing the food. It was amazing how much a couple of pieces of oranges and watermelon meant to the kids. Fruit such as oranges should not be seen as a treat for children, it should be something that any kid has the opportunity to enjoy. Some children even put the second piece of orange into their pockets for later on in the day but made sure it was out of sight from others so that they would be able to enjoy it on their own later on. This simple act of providing some fruit really highlighted to us the dire situation these kids face and some of the basics we accept as normal is not the norm for other places in the world. It was a huge reality check even after we thought we understood the situations the children faced. We are absolutely amazed by the children and their ability to survive some heart wrenching conditions in their home environments and still turn up to class with a smile on their face and want to learn. We give a huge praise to Catherine, the head teacher at the school and the work she does, not only from an academic sense but also from a social welfare perspective. Although we have been out of the schooling system in Australia for a few years, the lengths that Catherine has had to go to to encourage the children to attend school and be involved, would surpass any community involvement that a principal would be required to complete in Australia. After a week of volunteering and spending our third wedding anniversary sitting in our room eating instant noodles we thought we would treat ourselves to an overnight trip to Botswana to check out the Chobe River. Getting to Botswana required about an hours drive to the border of Zambia to get our passports stamped then another short drive to the river that divides Zambia, Zimbabwe, Botswana and Namibia. Then we took a short trip via a tiny little dinghy to the other side of the river into Botswana. The dinghy took several attempts at getting it started. Through immigration on the other side and a walk through some disinfectant to help stop the spread of foot and mouth disease we were in Botswana. The first day of the two day trip was fantastic. We went on the Chobe on a little jet boat and got nice and close to lots of hippos, elephants that were having a swim and loads of birds. We even got to see some buffalo and an assortment of different antelopes. One hippo even told us that he did not appreciate being disturbed and gave a half hearted chase. We then went to the lodge for lunch and a bit of a nap before setting off on the afternoon drive through the Chobe National Park. The drive was awesome even though we didn't see any lions and still no cheetah. We were lucky enough to see leopards, big herds of elephants and buffalo which is a sight that can not be written down in words. The elephants and buffalo were crossing the river into Namibia in search for some greener grass. To see that many animals move at one time is something spectacular. (It has nothing on The Great Migration of the Masai Mara and seeing it on a small scale has made us want to visit Kenya at some stage). Back at the lodge somewhat dusty from our drive it was time for dinner, on the menu was pasta with crocodile and eland (a sort of antelope) stew. Corrine was not even able to get through her entree of soup. The heat had been getting to her and she was not feeling the best. After Craig ate all of his meal including desert it was time to go to bed so we were nice and refreshed in the morning for another boat ride on the river... Unfortunately that did not happen. Corrine had taken a turn for the worse overnight and the thought of moving made her turn a deeper shade of green. The self diagnosed stomach bug was really making moving and the thought of breakfast unbearable. Craig enjoyed a romantic breakfast for one and was able to organise to get back to Zambia before the heat of the day really set in. After getting to the Botswana check point it was on to a cargo ferry along with two trucks and a handful of other people wanting to get to the other side a short walk to the immigration office and that is where the fun began. Corrine still not feeling well started to feel really bad and fainted. All the workers were really good and helped and even got a taxi through to where taxis are not usually allowed to so we did not have to walk further than we had to. After the ride back in the taxi and getting ripped off by the driver of the cost of the fare, we settled back into our accommodation in Zambia only to find out the power had been out for the last few hours. We later find out there is a rolling stoppage every Tuesday and Sunday for an undefined period. Back to school for Craig while Corrine spends some time recovering. It has now been a full week of volunteering at Linda Community School. If we said we have loved every minute of it so far, that would be a big, fat. hot and sweaty lie! It has been pretty tough. Both physically and emotionally. The only thing that we would change would be the heat though. It is getting to about 45 degrees Celsius. The school doesn't have any cooling system in place including fans. We we got to the school on Monday we glad we had worn our walking shoes. The first thing we did was go for a walk to see how some of the children lived. One child lives an hour walk from the school and sleeps in a tiny little mud and straw hut that he has to share with his brother. The hut would be about half the size of a disabled toilet cubicle you would find in a shopping centre. His three sisters share a slightly bigger hut that is also the kitchen. There is no electricity and closest source of water is about a kilometre and a half away at the communal pump. This pump also occasionally breaks so the village is has no real access to water when that happens. The pump was not working for a couple of days this week. When that is the case the school attendance drops dramatically until people are able to access water again. A lot of the children at the school are orphans who are being cared for by relatives. One child is being cared for by his uncle who is only 21 himself. Not only has he cared for this boy by himself since we was 15 he also has a small farm that is his only source of income. The children only go to school for half a day so that they can work for the other half and help their parents or relatives if they need to. The kids might be put to work on the small farms, collecting firewood to sell or even crushing rock in extreme heat that is sold by the wheelbarrow full for the equivalent of $1. It sounds as if these kids live a pretty bleak existence but they all come to school with bright smiles and are ready to learn. When asking the kids what they want to be when they grow up their answers are the same as kids in Australia. They want to be pilots, soldiers, teachers, nurses and farmers when they grow up. For the next couple of weeks the school is a couple of teachers short for various reasons. There are no substitute teachers so we have been given the grade six class to teach. The high light of the day for both them and us would have to be the sport. This week they learned how to kick an Australian Rules footy. There are some kids that there that I imagine talent scouts would take a keen interest in. They seem to be naturals. Today they played T-Ball... Well a very modified rules version. It must have been quite a sight as we gathered a pretty strong crowd of kids and adults from the community. It was great fun. The Wombat Team beat the Platypus Team. This week did not come with out any dramas though. There was in fact a Malaria scare that involved taking Corrine to the doctors clinic. It turned out to just be a cold which she had tried to tell people but no one was taking any chances and two injections in the backside later. One of them just in case it was very early stages of Malaria and not registering yet and another for the nausea (probably caused by the incredible heat) The trip to the clinic was quite an adventure. We both thought were seeing things when a cat came strolling out of one of the examination rooms into the waiting area and out of the door. There was also a dog just wandering around. It did make us wonder if we were in fact at a veterinary clinic instead of a human one. At least all is good and we do have a bit of a story to tell. Isn't that what traveling is about? We are off to Botswana for the weekend so we will surely have a tale to tell after that. We made our way from Victoria Falls in Zimbabwe to Livingstone in Zambia. What a crazy journey! It only took about 45minutes all up, including going through immigration in Zambia but it was a crazy 45 minutes and a little bit nerve wracking too. The trip took two different taxis. One to get us to the Zimbabwean border and then another to cross the bridge to the Zambian boarder. Leading up to the bridge there were a load of trucks and their drivers finalising their last bits of paperwork before heading into Zambia. There was quite a queue lining up but that could have also been because only one truck is allowed onto the bridge at any one time. Once on the bridge our taxi driver had to weave in and out of people making their way to the other country. Cars did not seem to be staying on their side of the road. People on bikes loaded up with with so many things your wonder how they can actually push the pedals. Once we got to the other side that is where the fun began. As soon as we got out of the taxi people were trying to grab our bags to help us and make a quick buck at the same time. We were able to fend nearly everyone off. It also seems that people here do not have respect for people's personal space. Either that or they are just really nosy! While showing our passports to guy in immigration the people were standing so close behind us they could have read the passports. It wasn't only the people behind us the people behind them got really close too. The guy going over all our paper work was not phased by this. He was too busy chatting to his friends on Facebook! After what seemed like forever we were finally issued the appropriate visa for volunteering in the country, charged $50 each (a figure he just seemed to make up out of the blue, although he did give us a receipt) stamped our passports. Then went back to Facebook, probably telling his friends that drinks were on him as he had just duped two Australians out of $50 each! We finally me our contact and driver while we are here and headed to the backpackers that will be home for the next two weeks. We have had a quick look at the school but we will tell you more about that later when we have some more to talk about. On Saturday night we went out to dinner at a little Italian restaurant called Olga's Italian Corner. All the staff their come from disadvantaged backgrounds. People who did not have access to schooling when they were younger so have no skills now. Olga's teaches them about the hospitality trade, (something Livingstone is not short of considering the many tourists about.) cooking and even carpentry. They are even opening a guest lodge and make a pretty good pizza. You can check them out at www.olgasproject.com. It was nice to see how eating out can make a difference. Today we went for a swim... Going for a swim, that's pretty boring you say.. Well it just wasn't any swim. We went swimming on top of Victoria falls itself. We went by jet boat to Livingstone Island and then for a short swim and walk out to the little pool named Devil's Pool and then took a big leap of faith into the water where we found ourselves right on the edge of the waterfall with only a natural ledge made of rock stopping us from going over. It was amazing to see the rainbows that the mist forms from such a birds eye point of view. We both did the jump without to much hesitation. We were both more nervous going gorge swinging than jumping off a rock metres away from the largest waterfall in the world. It was such a exhilarating experience. Once back on dry land we enjoyed a fantastic lunch on Livingstone Island. Hopefully the photos do what we did some justice and you can see how silly we both really are! We start our first full week at the school tomorrow so will hopefully have something to tell you at the end of the week. In the meantime if we have anymore crazy adventures we will be sure to tell you about them. We arrived in Victoria Falls without any dramas but were in for quite a shock when we landed though. Victoria Falls International Airport is the smallest airport we have been to. When we landed we were greeted with 37 Degree Celsius heat, then we herded towards immigration and customs like cattle. Even in big flash airports you feel like cattle waiting to go through but when the airport is no more than a shed with a couple of ceiling fans... Well you get the picture. Once at the hotel we were welcomed with iced tea and a cold towel. After settling in we hit the pool, AHH BLISS! We then dragged ourselves out of the pool to get ready for a sundowner cruise along the Zambezi. Then we found out that we had our days mixed up and the cruise was not until the next night. Disappointed that we dragged ourselves out of the pool for nothing we walked down the main street (which also seems to be the only street in Victoria Falls) to have a look whilst dodging all the illegal street hawkers trying to sell their dodgy wares. After an early night we got up early to go white water rafting down the Mighty Zambezi. From all accounts it is the best white water rafting in the world and we conquered it. We were all feeling pretty smug that we hadn't capsized and made it through grade 5 rapids, then we saw the climb up!! Our smugness was soon gone. The 2km walk up a 250m high gorge in 40 degree Celsius heat was an absolute killer! It took about 45minutes to climb up but at the time it felt a lot longer. That night we relaxed while having a few drinks cruising down the top of the Zambezi whilst taking the sights of hippos wallowing, an elephant and a magnificent sunset. The next day we hobbled like a bunch of grannies to see what we had come to see. The Victoria Falls. The sight was breathtaking but unfortunately there was so much mist from the falls around we were unable to get any decent photos of one of the wonders of the world. It would be a sight to see in the wet season when the falls are at their peak! After a quick dip in the hotel pool there was no time for relaxing as we had to head out for some serious adventure! We were picked up and soon after and taken to one of the gorges to go flying foxing, zip lining and gorge swinging! Gorge swinging is not as "adult club" as it sounds. It is similar to bungee jumping although you are strapped in at the waist. You then jump and free fall for about 100 metres, the rope then catches you and swing through the gorge! The flying fox was 200 metres above the gorge as was the zip line. After the action packed days we said our farewells to Tracy, Bruno and Marc and we are heading on to Zambia where we will be volunteering at a community school for two weeks. We got to Port Elizabeth without any dramas to catch our two flights to get to The Sabi Sands Game Reserve which is a part of the Greater Kruger National Park which is where we were to spend the next four nights. Our flight was delayed in Johannesburg which in fact turned out to be a blessing as there was a slight hiccup and we left some things on the plane from Port Elizabeth. Thankfully we were able to get them back. After a rather bumpy ride into Kruger/Mpumulunga International Airport we were almost at our destination, just another hour and a half bumpy car ride separated us from the animals. You could feel the excitement in the car with Marc and Tracy both snoozing away and everyone else other than the driver fighting with their eyelids to stay open. Once at Inyati we were welcomed with spectacular views of a heard of elephants grazing not so far away. It was an amazing sight for us who had been there before but even more so for the others who did not know what to expect. A quick refresher and some afternoon tea we were ready for the first game drive. Every game drive we went on offered a new adventure from leopards in trees, lion cubs playing, sundowner drinks with rhinos walking past through to seeing nature at work with a buffalo being a meal for lions first, then vultures and hyenas. Whilst on the drives, we had Piet as our guide and Nelson as our tracker, who also were our guide and tracker on our previous visit. Time and time again these guys were able to track and locate many animals, the list of animals was very extensive but the highlights were the big 5, zebra and giraffe. During the quieter time during the middle of the day Craig went for an afternoon jog with Piet through the park. The first morning drive after a awesome thunderstorm, we headed out only a few hundred metres from camp and the car was stopped. Nelson had spotted some tracks, a leopard dragging an impala. Following the tracks we come across where the leopard had dragged its kill, only to find lion tracks leaving the area. Later on we found the lions basking in the sun after they had enjoyed the remainder of the impala. We had some great people join us on our drives including Peta and Manfred from Germany. This post could go on forever but we are now in J'burg heading to Victoria Falls. See you in Victoria Falls! 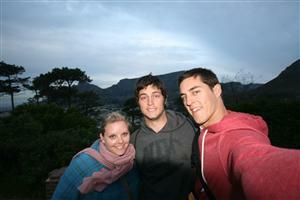 Knysna, a geyser and a few elephants! The higlight of our trip along The Garden Route happened in Knysna. While here it was Craig's parents Tracy and Bruno's 30th Wedding anniversary. We had planned a pretty awesome Surprise for them (even if we do say so ourselves) We organised an exclusive sunset walk with elephants at Knysna Elephant Park. After feeding them with the rest of the group we got to hang around and have extra cuddles (well as much as you can cuddle a four tonne giganton elephant!) and pats and got to walk with them before they bedded down for the night. The experience was incredible and left us lost for words. After the ellies were in bed we got our own private dinner and just reminisced about what we had just experienced. The fun didn't end there!! Once back at the guest lodge Corrine somehow managed with the strength of an elephant pull the shower tap out of the wall!! This left a giant hot water fountain coming out of the wall causing localised flooding to not only the bathroom but the bedroom and floor below when it seeped through the ceiling. Thankfully the owner was really good about it and got us into a different room that we are proud to say we didn't destroy. No photos were captured at this event. The next day a sheepish Corrine and the rest of the crew headed towards [[South-Africa/Jeffrey's-Bay]] with a quick stop at Monkey Land and Tenikwa Cat Sanctuary where we got up and close to cheetahs! Our next big stop will occur at Kruger National Park. See you then!! We set off to Mossel Bay from Hermanus, this was to be our longest road trip and all just to get to the begining of The Garden Route. There is not a huge amount to report on this particular leg of the journey other than having to stop for some more baboons which is quite the novelty for us. Even that night we didn't really do much other than get a free shuttle bus to a restaurant, something I think they should do at home. Hermanus... Strange name great place. We said goodbye to Cape Town and made our way to Hermanus (for those of you playing at home it is said Her-mar-nes) via The Cape of Good Hope, or as we called it “The Cape of Goodness me it is Windy I hope I don't blow away.” We still cannot figure out if the two and a half hour detour was worth it or not. We did tick off the obligatory photos in front of the sign that told everyone the co-ordinates of where they were along with the other tourists. The best thing about the visit was when a lady asking Craig if he could take her photo was almost knocked off her feet by the wind into him. I would not recommend taking small children here as they may get picked up by an updraft and blown out to sea... On the other hand if you are on holidays and want to get rid of your pesky kids The Cape of Good Hope would be a perfect place to take them. Feeling slightly wind blown we hopped into the car for our journey to Hemanus, we were treated with spectacular scenery of where the Atlantic Ocean meets the rocky cliffs. We drove along the cliffs and felt like we were in one of those emails you get of dangerous roads.. We saw some ostriches and even had to slow down for baboons. Baboons have no fear of cars it seems and will take their sweet time in getting out of the way. We were all on the look out for whales playing close in to shore but were not lucky enough to see any. Once in Hermanus we were blown away by the bed and breakfast were we were to spend the night. It was amazing. It was just like being at home but only better! All the rooms overlooked the ocean and the cliffs. The owners there have done a really amazing job. It made us want to retire and open our own B&B there. It would be great to go back and spend a few nights there. One thing that we were hoping to do was Great White Cage Diving, we unfortunately didn't get the chance as when we went to book the weather forecasts all said that there was going to be bad off shore storms and all the companies had canceled the trips at that stage, We are still holding a bit of a grudge against the weather man for being wrong and denying us a chance with the big fish when the weather turned out to be fine! Oh Well there is no use on dwelling on things that could have been, we still have a great adventure ahead of us. Next Stop – Mossel Bay!